From short films, to documentaries, to features, From The Heart has helped hundreds of filmmakers get funded. Start getting the money you need for your project. Our mission at From the Heart Productions Inc, a 501(c) non-profit, is help indie filmmakers get film funding. We do that through our Roy W. Dean Grant, our Fiscal Sponsorship Program, and the Intentional Filmmaking Class. Since 1993, we’ve assisted hundreds of documentary, feature, short films, and web series in getting funded. We believe that independent filmmakers, who devote most of their time to the creative process, need help when it comes to raising money. Our mission has been to help filmmakers get the film funding they need to get their film in front of the cameras and an audience. We’re proud to have been awarded this Badge by GreatNonProfits.org for being a 2018 Top-Rated Non-Profit! Our personal attention and experience can make the difference for you when you need film funding. We can give you advice on creating trailers, fine tuning your pitch, and creating a community around your film. Fiscal Sponsorship – As a 501(c)3 non-profit, we can offer donors tax deductible donations. Roy W. Dean Grant – Offered 3 times each year, the grant has awarded over $2,000,000 in film services, goods, and cash to filmmakers just starting their projects. Intentional Filmmaking Class – Learn how to get your film funded and how to reach your potential as an artist. 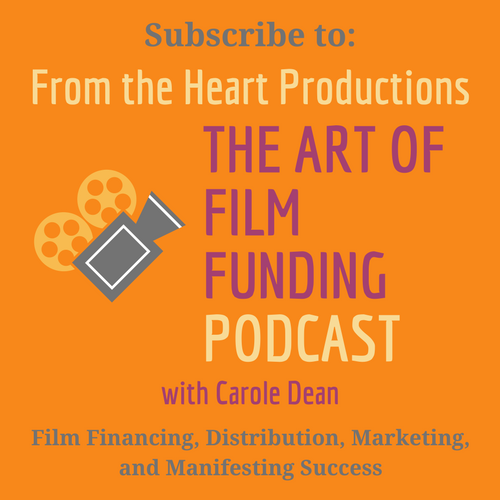 Personal Consultation – Carole Dean, president of From The Heart, authored “The Art of Film Funding” will work with you one-on-one. Crowdfunding – We’ve helped filmmakers raise over $2.5 million via crowdfunding. Our fiscally sponsored filmmakers can raise money on our own platform where donors are given opportunity to cover your fees. 74% of all donors contribute to help pay filmmakers fees. You can work with us on Seed&Spark, Indiegogo, Generosity, Kickstarter, and more. If you’d like to aid us in our work supporting, funding, and educating great filmmakers, please consider a tax deductible donation. Or contact us if you’d like to volunteer your time and expertise.